Ruins of Machu Picchu, Peru (Image credit: Leonard Farra). 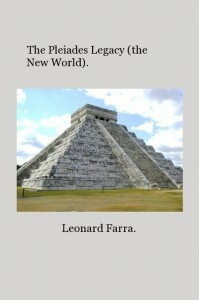 Around 5,000 years ago, when Earth was in total upheaval, as a result of climate change and flooding, numerous versions of a sky-god religion spread around the world and its been an influence on many aspects of human life right through to present times. According to legend, our world was visited by civilising sky-gods who taught man agriculture, and many useful arts, but who later destroyed evil people with a flood. One of the ‘civilising gods’ had the appearance of a tall, white, bearded ,man who wore a long white robe and carried a multi-purpose staff which could be used for healing, dowsing, etc. Although he had long since been gone, many early people enacted religious rituals celebrating his ‘annual return’. Many of the Ancients associated their visitors with the Pleiades whose stars played a major role in early religions and traditions. These ‘Seven Sisters’ were linked with ‘The Flood’, the Creation of the universe, the civilisers of man, and the beginning of the agricultural season. Some people believed that their ancestors came from them and that they will return there when they die. Their appearance, at certain times of the year, regulated some of the early calendars and heralded the dawn of a new age. 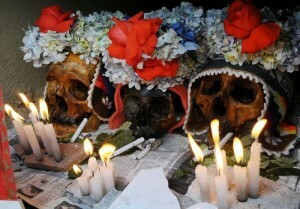 Peru’s Festival of the Dead (Image source: Peruforless.com). At the end of an era, or of the year, in cultures separated by time and space, fires throughout the land were extinguished and were relit after the Pleiades appeared. And around the beginning of November, in countries which allegedly had no contact with each other, when the Pleiades appeared, people celebrated the Festival of the Dead when departed souls were thought to return to Earth. In the era around 3,000 b.c.e, when a major El Nino event occurred in the Pacific, a civilisation arose in the Supe Valley in Peru and it lasted for about 800 years. In the upper level of the city of Caral, 14 miles in from the coast, there was a ceremonial site with six large platform mounds. The circle was also of special significance to the Caral people as they built sunken circular courts and on the summit of their pyramids they had a circular altar. 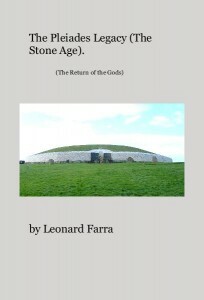 They also aligned a stone circle, with a central standing stone, to their tallest pyramid. A few stone circles have been found elsewhere in Peru, in Brazil, North America, Easter Island , and in many other countries, but not nearly as many as in the British Isles where a standing stone surrounded by a circle of stones was a common feature. A circled dot often appeared in stone age art and in Egypt, it was a symbol of the god Ra. Surrounding a stone with a circle implies that there is something special about it. Could it be that it represented a god in his circular home? Engraving of Chavin culture’s ´staff god’ (Image credit: callisto.ggsrv.com). Researchers, at Caral, were intrigued to find a small male figure , dated around 2280 -218 b.c.e, which was shown wearing a hat and holding a staff in his right hand and, possibly, a snake in his left hand. This figure appears to represent the Early World’s civilising god who was depicted in the form of the staff-god in Peruvian art. Chavin de Hauntar, in the Mosna Valley in the Northern Highlands of Peru, is thought to span the period from 850 b.c.e to 200 b.c. e.
Chavin’s Old Temple consisted of a U shaped pyramidal platform, open towards the rising sun, and in the centre of the two wings there was a ‘circular’ plaza. The axis on the west is said to be ‘ remarkably near the azimuth of the setting of the Pleiades around the time of its construction’. The 7ft tall Raimondi Stone, now in the Lima Museum, originally stood somewhere in Chavin but its original position is unknown. This stylised ,mystical, stone, which has snakes rising from its head, represents the Peruvian staff-god holding an elaborate staff in each hand and it appears to be a later version of the figure that was found at Caral. Around the circular plaza, there are several slabs and on some of them there is symbolism associated with the sky-god religion. One slab shows an individual blowing a shell trumpet and another depicts a figure holding a staff. Twenty conch shell trumpets have been discovered at Chavin which suggests that they were blown on important occasions. In the southwest corner, of the site’s lowest plaza’s upper level, in its New Temple, there’s a limestone slab upon which are carved seven circular depressions resembling the Pleiades. As these stars were of special significance at Chavin, could it be that, when they appeared, on important festivals, staff-carrying priests blew conch shell trumpets and rituals were enacted that related to the return of the staff-god? Around 200 b.c.e, when Chavin came to an end, the Mochica civilisation arose on the North Coast of Peru. The Mochica were a highly skilled warrior people who built pyramids, and temples, and who practiced human sacrifice. 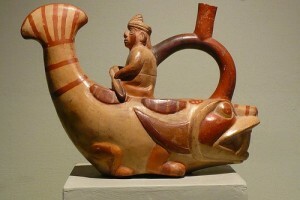 Mochica pottery work (Image credit: historiacultural.com). It’s generally believed that their calendar began with the rising of the Pleiades, (i.e a new beginning), as it did others in Peruvian cultures. Their supreme god, Ai Aepeac -the decapitator, was shown with a human male torso ,clawed feet, snakes for hair, and holding a staff and so he appears to be a hideous version of the staff-god . The Mochica are famous for their stirrup jars which show scenes of everyday life ,and religious themes, and one scene reveals that the Mochica used the same type of sacred architecture as other early followers of the sky-god religion. The age of the Andean Tiahuanaco civilisation is very controversial. According to the conservative point of view, it flourished from 300 .C.E to 1000 C.E. but some alternative scholars suggest that it could date back 14,000 years. What’s not generally appreciated, though, is that there is sky-god architecture at Tiahuanaco, ( i.e the Akapana pyramid), a version of which was depicted on the Mochica jar, and which dates back no further than 5,000 years. 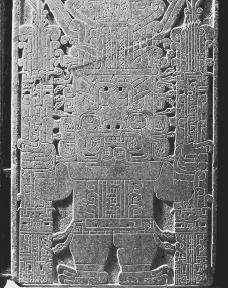 According to Christobel de Molina of Cuzco.1873 : ‘the Creator was in Tiahuanaco and that was his principal abode’ The Creator, (Virachoca), is thought to be represented on Tiahuanaco ‘s monolithic Gateway of the Sun where he is shown holding two serpent like staffs with jaguar and condor features. This supreme god is standing on a three-tiered stepped pyramid and he’s surrounded by 32 winged, staff ,figures kneeling on one knee. The trumpet blowing figures, on this monolith, suggest that they are announcing his arrival. According to a popular theory, the Gateway of the Sun represents a calendar and ,if so, then H.S .Bellamy’s suggestion that one the trumpeters is linked with the winter solstice and another with the summer solstice might be correct especially since it’s in accord with other Peruvian traditions. The indications would appear to be that after the priests at Tiahuanaco sounded their trumpets, on the solstices, a priest, representing Viracocha, dressed in long white robes and carrying a staff, stood on the summit of the Akapana which appears to be associated with the Creation. The congregation of mixed races standing around the pyramid, who enacted the colourful rituals, may have included the peculiar cone-headed people whose skulls are on display in the local museum. Although Tiahuanaco was abandoned before the Incas incorporated it into their empire, it might have influenced their religious traditions. The Incan civilisation dates back 700 years and it ended 200 years later when it was destroyed by the Spaniards. 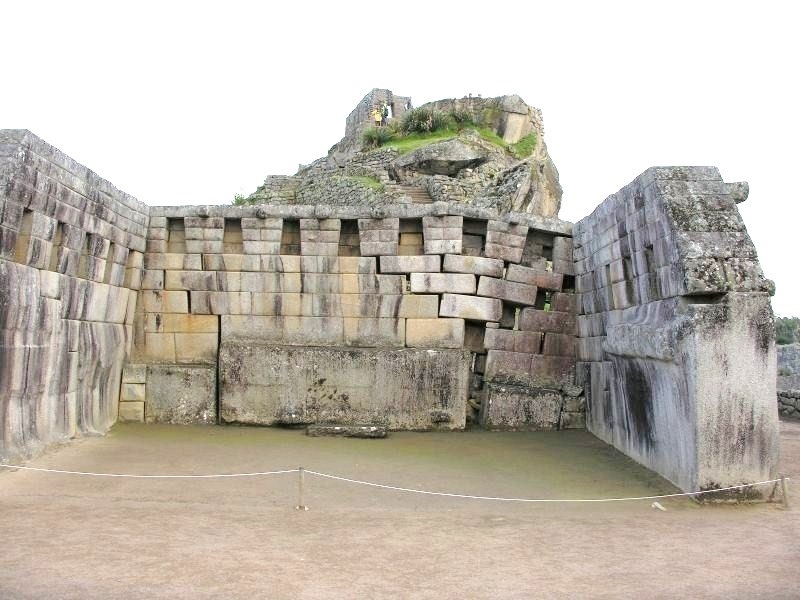 The Incan capital, Cuzco, was surrounded by the four provinces and in its centre stood the sacred Coricancha temple which was built with huge ,close-fitting, blocks of stone. Only the Incan nobility were allowed into this holy sanctuary. Astronomy played an important role in Inca religion and the Coricancha was dedicated to the worship of the Sun, Viracocha, (the Creator) and the Pleiades to which it was astronomically aligned .The Pleiades were of special significance to the Incas and ,in common with several other early people, they regarded them as the great mother of all creation. The Coricancha was also aligned to the equinoxes and solstices at which time festivals were celebrated. Representation of a condor amongst Nazca lines in Peru (Image credit: perutoptours.com). Viracocha was described as a tall, white, bearded, man who wore a long white robe and carried a staff and he appears to be the staff-god who was depicted nearly 5000 years ago at Caral. When the bearded Spaniards arrived in Peru, the Incas thought that he had returned with his companions . 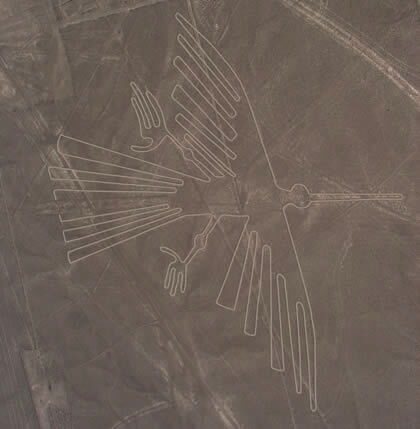 Many early gods were associated with a bird and Viracocha’s companion was the condor which is represented by a 440ft drawing in the Nazca Desert. Several other sky-god symbols are also etched into its surface among the thousands of lines and drawings. Capac Raymi, one of the two most important Incan festivals, began the first month of the Incan year and it was celebrated on the December (Summer) solstice. The festival lasted for several days and the ceremonies took place in Cuzco’s great plaza with colourful processions starting from the Coricancha. On the eve of the festival, the Incan priests blew conch shell trumpets and for three days prior, no fire was allowed in homes . A new flame was later lit and it was distributed among the people. Capac Raymi was a time of renewal when some of the young boys were initiated and, in a custom which was popular in several earlier Peruvian civilisations, and elsewhere, such as on remote Easter Island, their ears stretched for the insertion of ear plugs. These boys later became known as the Orejones-the long ears. The Capac Raymi celebrations began when the Pleiades appeared and started the year. In the Nazca desert there is a huge white sand dune, Cerra Blanco, where the sun rises around the December solstice, where Viracocha ‘descended from the sky’. Over in Cuzco, a colourful procession, probably led by priests, circled a statue of him in one of the rituals and as the Incas believed that the dead returned to Earth on the December solstice, this may be one of the reasons why the ancestral mummies were paraded in the Capac Raymi festival. The other main festival, Inti Raymi, also lasted several days .It was celebrated on the June (winter) solstice and people came to the capital from all over the empire to join the joyful celebrations. Dancers at the Into Raymi festival in Peru (Image credit: Wikipedia). At an early point in the rituals, the priests left the Coricancha and proceeded to a high vantage point where they waited for the Pleiades to appear. The Incas called these stars Collca, (the granary).They associated this festival with the harvest and made offerings to Viracocha who protected their crops. In some of their Inti Raymi rituals dancers wore wings to represent the god’s companion-the condor. Peru’s famous Incan site, Machu Picchu, is perched on a small hilltop, between two mountains, overlooking the Vilcanota river. The complex is divided into three areas, agricultural, residential, and sacred, but it’s the sacred region which draws our attention. Intihuatana stone at Machu Picchi (Image credit: Leonard Farra). 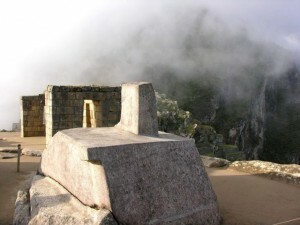 On the summit of a rock, reached by a flight of stairs, rear of the main temple, there is a carved rock-the Inti huatana – the Hitching Post of the Sun , which is aligned to the equinoxes and to the December solstice when the sun sinks behind the snow-covered Pumasillo in the western Vilcabamba range. The December solstice, ,as we have seen, began the first month in the Incan year when Viracocha’s presence ( return? 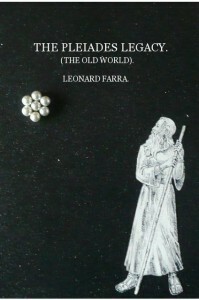 )on Earth was celebrated . There are also alignments , at Machu Picchu, to the June solstice ,(the Inti Raymi harvest festival) and to the rising of the Pleiades on that day. The June solstice alignment is linked with certain ‘star-god related architecture’, in one important sanctuary, which is also found in the main one. Based upon what happened in Cuzco’s religious rituals, and the astronomical alignments at Machu Pichu, we can surmise that immediately prior to the solstices, Machu Pichu’s priests scanned the sky for the appearance of the Pleiades and when they appeared conch shells were blown. 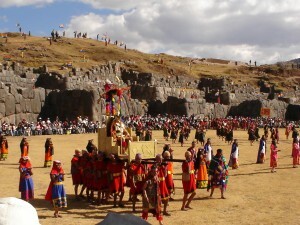 This ritual was followed ,on the respective days, by Capac Raymi and Inti Raymi ceremonies. Viracocha may have ‘arrived’ at Machu Picchu on the December solstice, to start the year, and, as at Cuzco, a statue of him might have been carried in procession by the priests As his companion, the condor, was represented in stone at this remote site, winged dancers might also have taken part in the celebrations. Many of Viracocha’s counterparts , such the Moche Ai Apaec, Quetzalcoatl in Mexico, and Osiris in Egypt, were linked with a snake. This animal was a popular symbol in Cuzco and at Machu Pichu there is a rock which has several serpents etched on its surface. 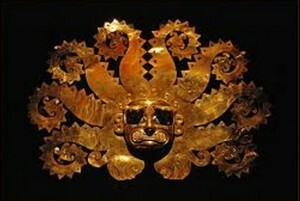 Mask of Moche Ai Apaec displaying serpent-like features (Image credit: www.taringa.net). 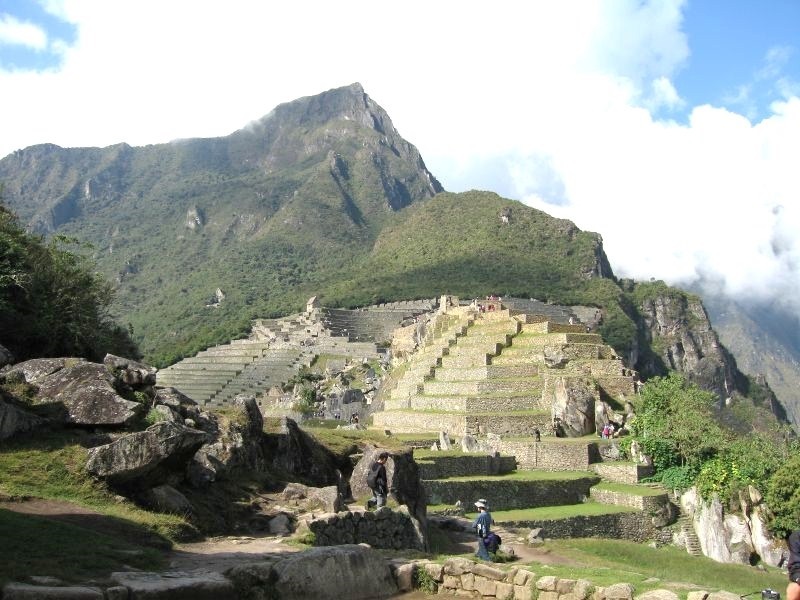 It would therefore appear that the origin of the religious ceremonies enacted at Machu Picchu dates back to events that occurred 5,000 years ago which were associated with the Pleiades and the entity who the Ancients called the ‘civiliser of man’. In other words, Machu Picchu was one of numerous sites around the world which was associated with the Pleiades linked sky-god religion. With regard to Inti Raymi, it was re-established as an Indian festival, on 24 June, in 1930 and at that time, hundreds of thousands of pilgrims now travel to a high spot in the Andes where they await the appearance of the Pleiades. Staff in one hand, as symbol for Powers, and snake in another hand, as symbol for Knowledge and we have holder of Universal Mind…of course , human body must be in Bliss of Nirvikalpa State of Consciousness : that 8th spoke in Buddhist Wheel of Life …..that is Trinity of God, looks like….V-I-R-A-C-O-C-H-A (80) = K-R-I-S-H-N-A (80) “travelling widely”, at the age of 84…5.000 years ago…but what about “travelling” Christ , at the age of 74, as far , as Japan ? never mind, we all have year 2012, now with Julian Calendar, because of Universal Plan…and Mayan Calendar is Right ! what the next ? New Golden Age ?